There's something about the smell of gingerbread that just screams Christmas. I don't even know what it is, it's not even a tradition in my household- but I love it! For all you gingerbread first-timers this recipe is about as easy as it can get! 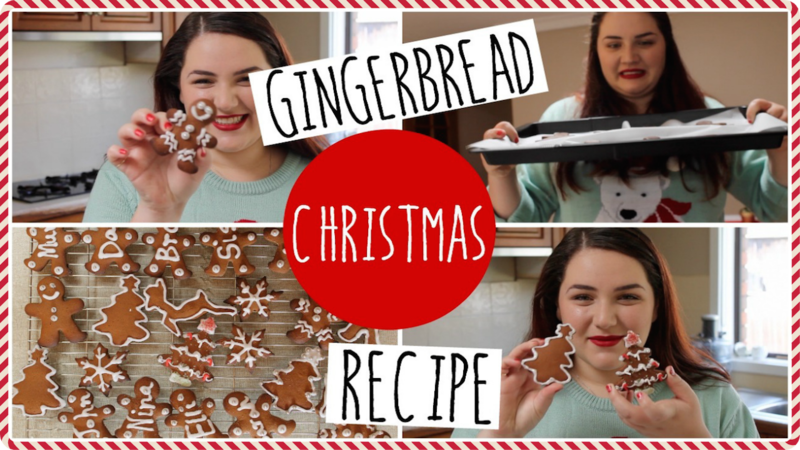 Follow my instructions and you will end up with some deliciously yummy ginger treats in no time! 1. In a large bowl, sift the flour, spices, baking soda and salt together and set aside for later. 2. In a mixing bowl cream together butter and sugar until light and fluffy. 4. Gradually add the flour mix in 3rds, mixing in every addition until well combined and dough-y. 5. Split the dough in half, wrap in cling film and refrigerate for 1-2 hours or even overnight. 6. Preheat your oven to 180 C and line your trays with baking paper. 7. On a lightly floured surface, roll out the dough to about a thickness between 1/2- 1cm. My tip here is to dip the cutters in some flour before pressing them into the dough as this way it won't stick to the inside of your moulds and you can easy place them on trays. 8. Bake for about 8- 12 mins, I found 8 was just right for me but this can vary on the size of your gingerbread men. 9. When you remove the cookies from the oven, let them cool slightly on the tray before transferring to a wire rack to cool completely. Mix together the icing sugar and lemon juice until a thick icing paste forms. If you find that your mixture is not forming together you may choose to add a little more liquid- or if you're having the opposite problem and your mixture is too runny you may add in some more icing sugar to thicken it up. What's your favourite Christmas time scent? Leave me a comment below! Muchos love for Christmas! Haha thanks! Yes, baking always puts me in a festive spirit! Let me know how you get along!